Samsung Group chief Jay Y Lee arrives at a court in Seoul. The third-generation leader of South Korea's top conglomerate was mostly silent at his first court appearance in what has been called the "trial of the century", as his lawyers laboured to portray him as an innocent bystander in a graft scandal. Jay Y Lee, the 48-year-old boss of Samsung, is on trial on charges including bribery and embezzlement in a scandal that led to the ouster of president Park Geun-hye. "The defendant, Jay Y Lee, didn't even know that the contribution was made, because that's not part of his job," his lawyer, Song Wu-cheol, told the court. Choi, a former Samsung Group vice-chairman considered a mentor to Jay Y Lee, the vice-chairman of Samsung Electronics, left the conglomerate on 1 March after it dismantled its corporate strategy office ? a nerve centre long considered an instrument for the founding Lee family's management of the companies. Lee appeared gaunter in a white shirt and grey suit, having lost some of his C-suite polish. He was mostly expressionless at the trial, nodding occasionally when one of his attorneys reiterated his previous denials of bribe payments. Lee's lawyers said the Samsung boss made financial payments in response to requests by then-president Park and sought no favours in return. The leader of the smartphones-to-biopharmaceuticals business empire is the only founding family member among the country's most powerful conglomerates, called chaebol, to be indicted in a graft scandal that led to Park becoming South Korea's first democratically elected leader to be removed from office. Park was arrested on charges such as colluding with Choi to pressure businesses such as Samsung to contribute to foundations that backed her administration's policy initiatives. 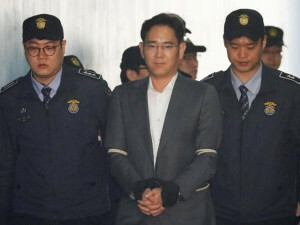 The defence team said Lee and other former and current Samsung executives felt threatened in their interactions with Choi Soon-sil as Samsung provided financial support. Prosecution evidence showed president Park rebuked Jay Y Lee during a July 2015 meeting over inadequate support for the equestrian community. "Do you know what will happen to the company if the president keeps getting angry?" former Samsung Electronics president Park Sang-jin quoted Jay Y Lee as saying, in a document presented by the prosecution. But the special prosecution says Lee actively curried Park's favour to cement his control of the family business empire. "We have secured enough evidence proving that defendant Lee Jae-yong made improper requests to the president," said Park Young-soo, the special prosecutor, referring to the Samsung leader by his Korean name. Lee sought Park's help in maximising his control of the Samsung companies at the lowest possible cost, he added.